On October 4, 1975 this would be what you would see if you were down at the Ballard Locks between 1:00 and 5:00 pm. 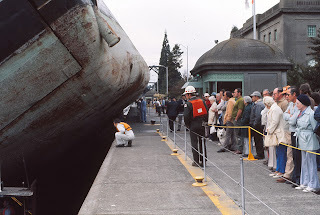 The full story behind this photo has not been told and is only known by a few but we are attempting to gather the complete details concerning this day at the Ballard Locks. 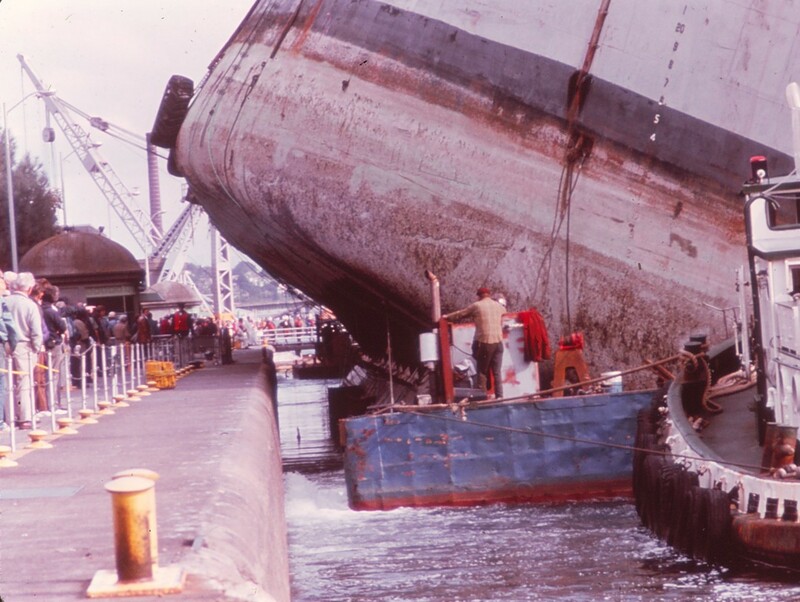 What you are seeing in this photo is the dry dock "White Sands" being towed stern first into the large lock by the Josie Foss, captained by Bob Hayden and the Dorothy Foss, captained by Lee Crider (just behind the dry dock). This was the second attempt to bring the dry dock into Lake Union. 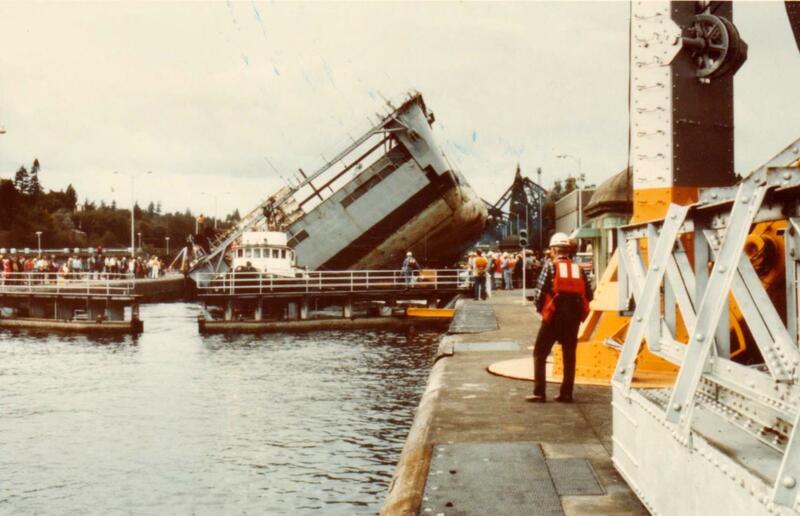 The first attempt on Sept. 9th failed when one of the barges attached to the hull broke loose. 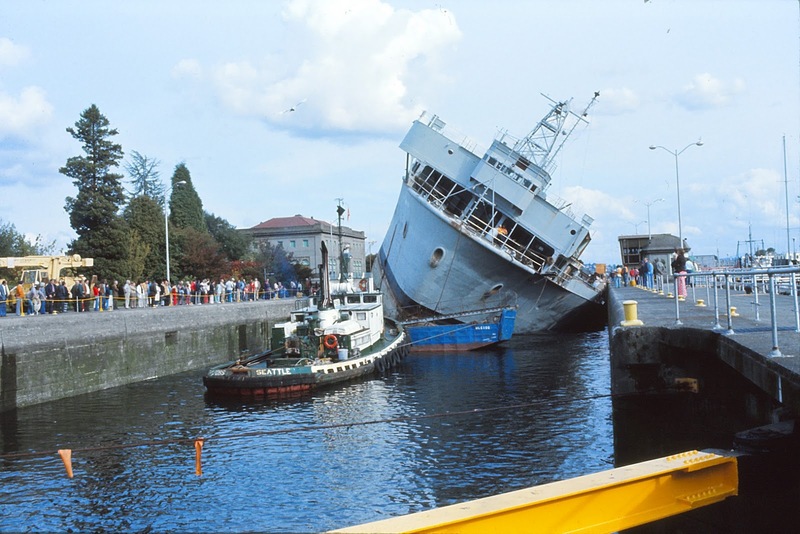 The barges were used as part of the plan to angle the dry dock sufficiently so as to clear the walls of the lock. We are still looking for others with information concerning the failed first attempt. Any tug operators, pilots, crew or witnesses to the event are invited to contact us with your memories of the day. 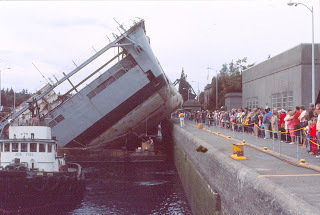 It is worth noting that this was just the latest in unique events involving the dry dock, and some of that history we can tell here. 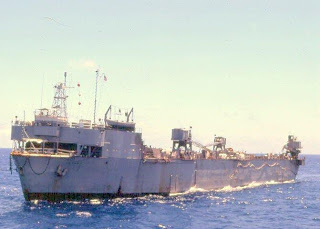 The White Sands was purchased by the US Navy in 1943 as an Auxiliary Repair Dock (its original designation was ARD-20) to service Navy vessels during WW II. As it had no propulsion components at all, it would be towed out to sea and would simply serve as a more or less stationary work place. 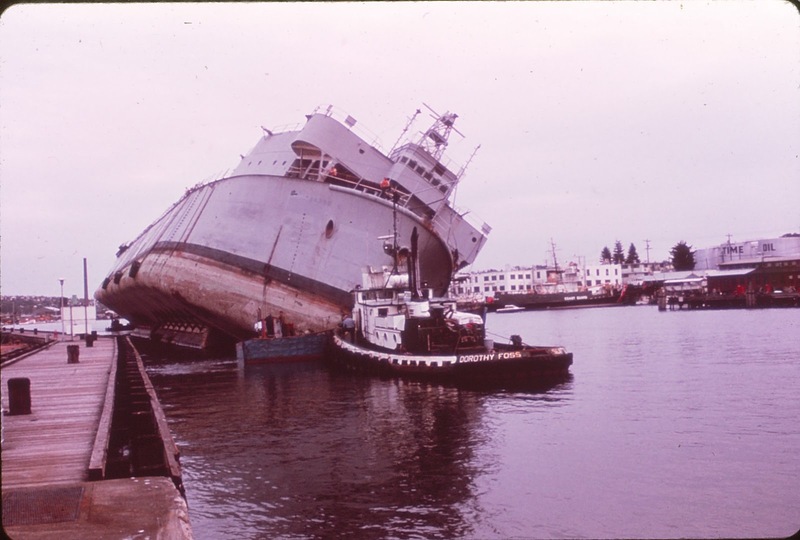 The dry dock could fill its ballasts with water and by doing so lower itself until the boat needing repair could sail into the work area. 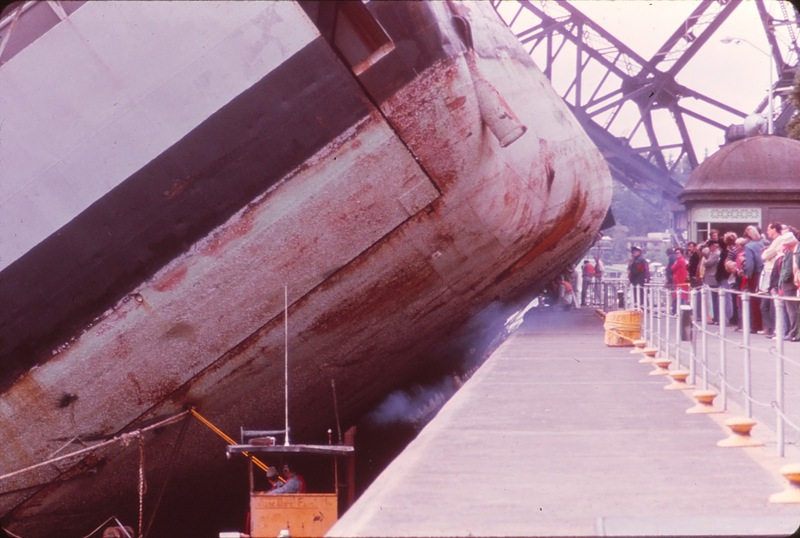 The water then being pumped out the crew could enter the floor of the dock and perform all needed repairs. There will be some links at the end to slide shows put together by navy personnel during their service on the White Sands and accompanying vessels. After WW II it was used by the CIA on several secret operations. One of which was to recover secret satellite photographs which had dropped to the ocean floor when the midair capture by a cargo plane failed. 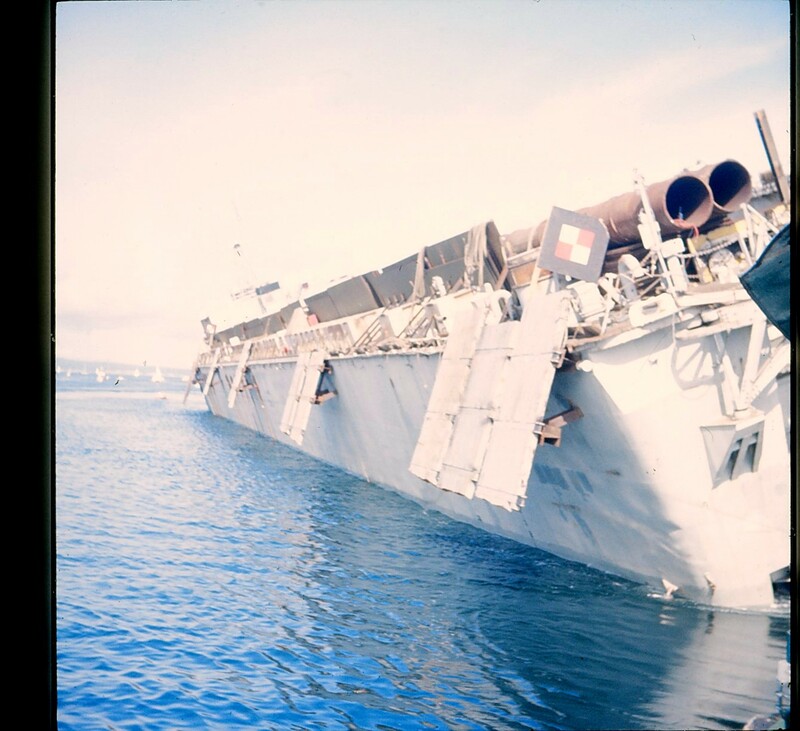 It was commended by the Navy for its service in recovering valuable intelligence. 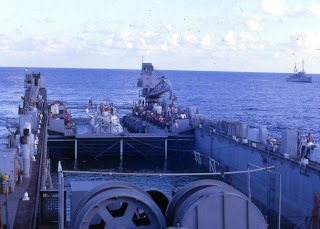 Another operation involved the search for a sunken US sub, the Scorpion and a Russian sub, the K-129 which had sunk several months before. Accounts differ as to whether or not the White Sands was involved in recovering part of the Russian sub but its efforts into the search and recovery of the American sub ended before successful completion. With such an illustrious resume it is understandable that as far as the White Sands is concerned ... the unexpected is expected. In San Diego in 1974 the Navy de-commissioned the White Sands and it was sold to Marine Power and Equipment, owned by Peter Woeck, for $1m dollars. The company had won 2 large contracts, each worth $18m, from the Navy to construct 42 custom barges. Larry Gillespie (son-in-law to Peter Woeck) was then put in charge of traveling to San Diego with a small crew, inspecting the dry dock, overseeing all necessary repairs in preparation for its journey north to Seattle and then into Lake Union where it would be permanently moored. It would be the largest dry dock in the immediate area and give it greater flexibility as to the size and number of the projects it could work on simultaneously. There was, however, one detail which would, on its face, render the idea completely impossible. The large lock was 80' wide, while the dry dock was 81'. As we all learned in school: 3 into 2 won't go. But then ... as the Army says, "The difficult will be done immediately. The impossible will take a little longer". This was the start of a remarkable feat of engineering with which all involved can justifiably be proud. Another $286k dollars was spent to repair, retrofit and add equipment necessary for the operation and Larry Gillespie and crew having completed the work set sail for Seattle towed by another Marine Power and Equipment vessel at the plodding speed of no more that 4 knots per hour. According to Larry it was a full two weeks to make the trip up the coast at which point the White Sands would be moored and preparations for planning and altering the dock for passage through the locks would begin in earnest. Peter Woeck would have to convince the Army Corps of Engineers that it would be possible to get the White Sands through the lock without endangering the lock itself which would be a major financial setback to many local businesses which rely on access between Puget Sound and Lake Union and Ship Canal. One idea was to carve out a couple of feet along the length of the White Sands and tow it through vertically. Cost and time estimates, however quickly eliminated this approach. Although the 81 feet of width is the focal point of this adventure the docks length of some 491 feet would explain this idea being scrapped. A trusting Richard Woeck checking clearance. Working with a local naval architect, J. Fisker-Andersen, the two men devised something of a Rube Goldberg scheme to make the impossible... possible. The idea finally agreed on was to tilt the vessel, thereby decreasing the effective width of the dry dock. One side of the White Sands would be weighed down with 51 concrete blocks at 326 short tons and 17 stacks of steel plate weighing another 900 tons. In addition the ballasts would be flooded on the port side to further lower that side. On the opposite side were to be 2 air filled barges fastened to the hull of the dock which would further raise that side and give the vessel the angle of list necessary to enter the locks on a high and rising tide and clear the walls on either side of the lock. If ever the phrase "Time and Tide wait for no man" would be relevant it was now. They presented this idea to the Army Corps of Engineers and although we have found no records of the meetings or correspondence between the parties as of yet, we have found some references to the effect that discussions were held to address concerns as to the viability of this unorthodox plan. 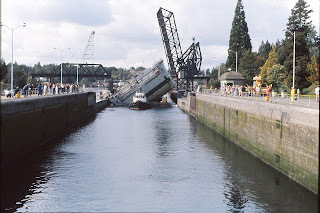 If anything was to go wrong during the transit through the lock there could be significant damage to the lock itself at a great cost to the taxpayers. Not to mention all the local industries which depend on access to the Sound losing that access for however long it would take to extricate the White Sands from the lock, and whatever costs that would entail. 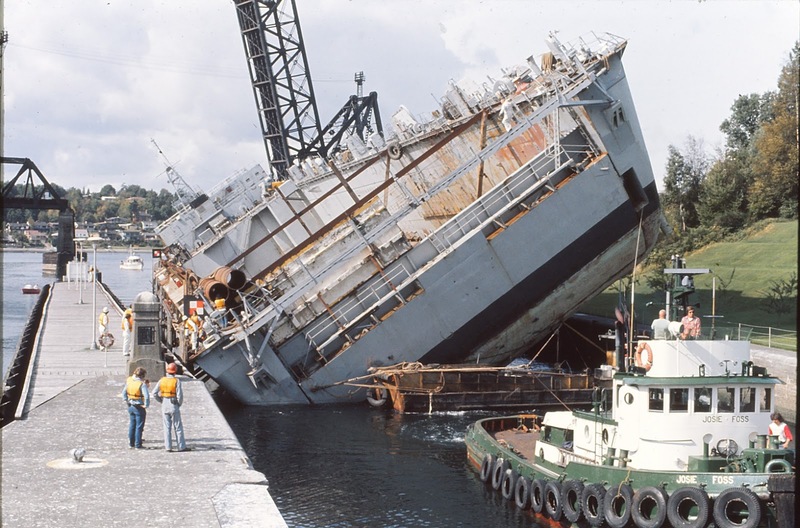 Because this was a project targeted for the Navy and the financial benefit having the dry dock in Lake Union would bring to related businesses, the Corps were dedicated to doing all they could to assist in this endeavor, whatever the obstacles. J. Fisker-Andersen apart from his talents as a naval architect, was also an early adapter to the emerging computer technology and was noted for his expertise in the software being developed at the time designed specifically to calculate ships stability under various conditions including a ships list, weight, and the effects of tides and wind. He was able to develop a computer simulation from the facts and figures which Peter Woeck had arrived at in order to develop a feasibility demonstration to show that this once in a lifetime adventure could succeed. Two of Marine Power & Equipment employees enjoying the ride. Computer enactments were carried out to calculate the degree of tilt necessary for the dry dock to clear the sides of the locks , and the ballast and tide requirements, all of which needed to mesh seamlessly in order for the operation to succeed. The White Sands would have to enter the large lock as the tide was rising and be entirely inside the lock with the lock gates shut before the tide started to fall so as to avoid being stuck, resting on the lock walls. As well as that, it was necessary to make sure to get the dry dock into Shilshole Bay by a certain time as the railroad bridge could only be raised during a certain window to allow for scheduled trains. There is no question but this effort had a lot of moving parts and the margin for error was no more than 18 inches and barely an hours worth of high tide with which to work. The morning of Sept 9 started out with a meeting at Pier 90, where the White Sands was docked, with all the principals involved. The transit would involve the Coast Guard, who were to ensure boat traffic in the sound was of moderate enough speed as to not create too much wake, the Army Corps of Engineers, Foss, and Marine Power and Equipment. A detailed diagram was unfolded to describe the step by step maneuvers necessary to accomplish this endeavor. 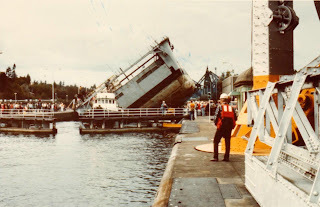 There were two tugs, each with a crew of 5 personnel and a pilot from Puget Sound Pilots aboard each tug to ensure safe passage from Pier 90 into the locks. The boat traffic on the Sound was monitored and speeds lowered to ensure there would be no wake which could endanger the mission. When this unusual flotilla made the turn to enter Shilshole Bay one of the flotation barges broke free from the White Sands. The exact cause has been attributed by various parties to an overly sharp turn or possibly a combination of wind and small rolling wave, but whatever the reason, this was to doom the effort... temporarily. 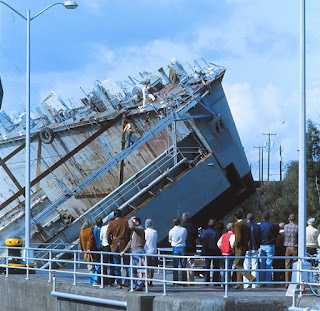 Larry Gillespie was on the deck of the White Sands when the accident happened and described the immediate fall and rebound of the dock as the barge flew out. "I was walking outside when the barge came out from underneath us and it went from 32' (height) to 0' (and back) to 32' ... we just hung on"! Richard Woeck, Peter's son and company vice-president remarked that witnesses said that when the barge broke free it sailed through the air hundreds of feet. It was remarkable there were no other boats in its path. An accompanying tug sped after the wayward barge, fastened a line to it and it was brought back to Pier 90 along with the White Sands. The next chance that year when the high tide would accommodate another effort would be Oct. 4, but of course that meant getting further into winter weather and risks of storms or high winds could also scrap plans possibly for months more. In any event, the barge was re-attached to the hull of the White Sands with much heavier cables and other modifications, enough to provide 200 percent of the tension required. With that done there was nothing to do but wait for the day and hope for calm weather. The second attempt would closely mirror the first with a few exceptions. Namely, the speed from Pier 90 to the locks would be reduced to 1 knot and so extra time would have to be allowed to accommodate this, and the White Sands would be tilted to only 26 degrees for most of the voyage and only when it arrived at the locks would it be tilted to the 38 degrees required. The day before had seen a storm pass through the area with winds of up to 40 knots. 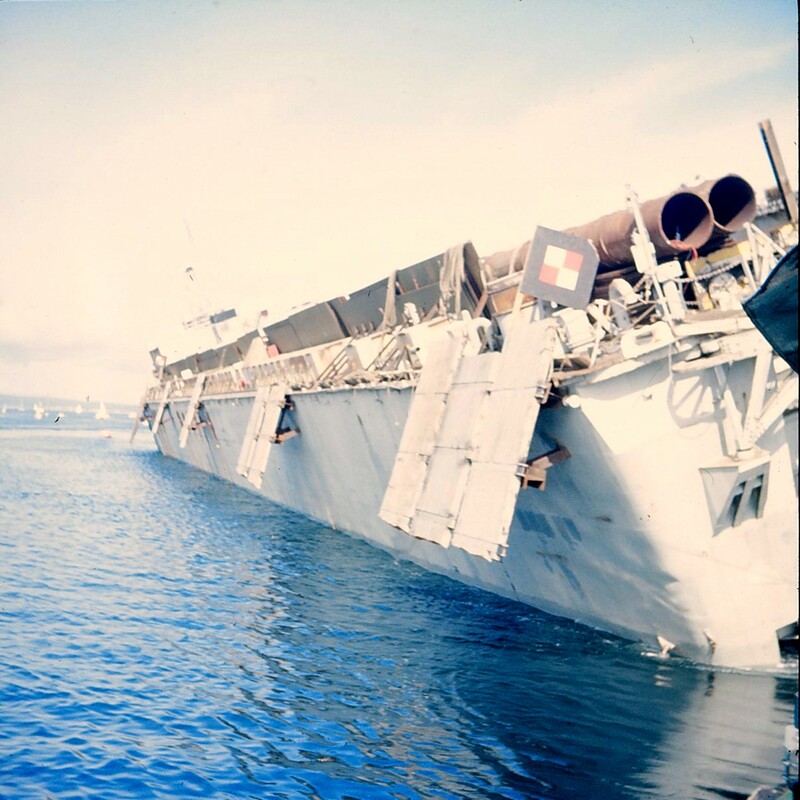 The cut off point was winds could not exceed 20 knots or the operation would have to be called off. Luckily for all concerned the weather had improved by the following morning and history was about to be made. While we have not learned the names of the tug captains from the first attempt, on this attempt the lead tug, the Josie Foss, was captained by Bob Hayden, and the rear tug, the Dorothy Foss, was captained by Lee Crider. 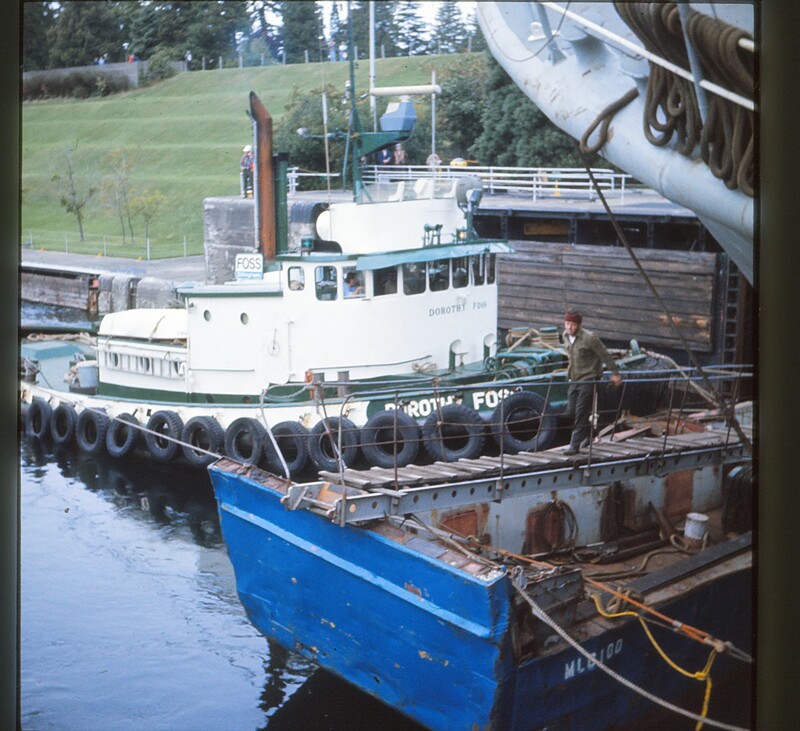 Each tug had a crew of 5 and had a Puget Sound pilot on board. 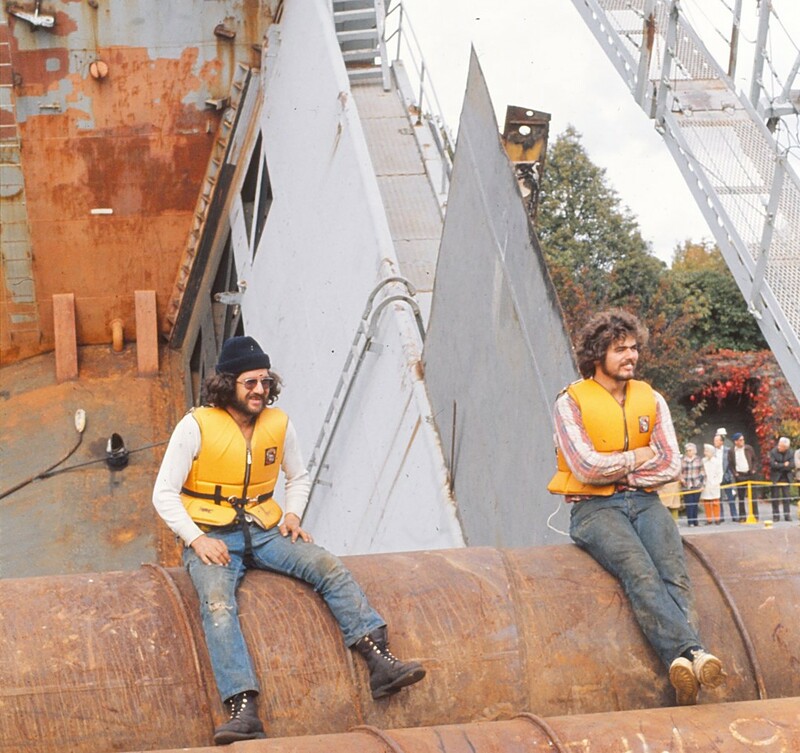 They left Pier 90 in the morning and arrived at the locks by 1:00 pm and when the dock had been angled to the final 38 degrees, they started entering the locks. This was ahead of the scheduled time because the White Sands had achieved even more buoyancy than required and the slowest ever lock entry would now begin. Between the tugs and the dry dock, both front and back, were 2 additional vessels joined to the dock and manned by 2 people on each. This craft was used to maneuver horizontally in incremental distances so as to avoid any damage to vessel or locks. 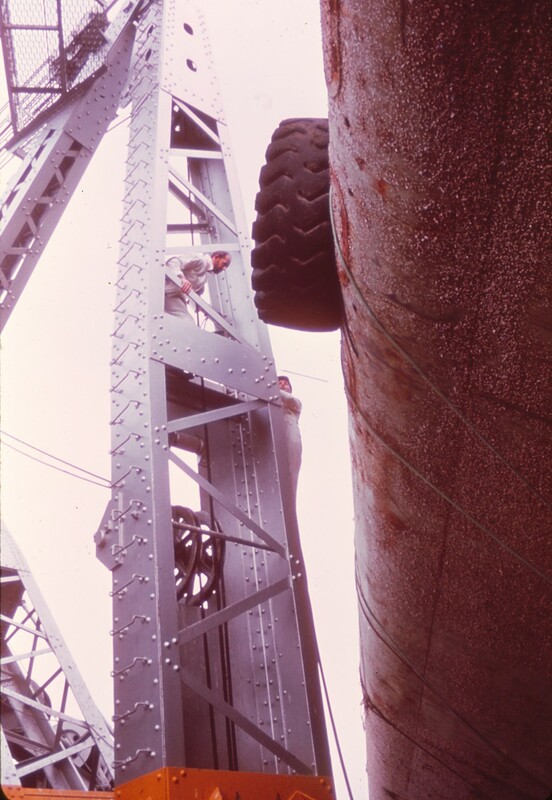 The largest clearance between dock and lock wall was 18" and the distance at the far end from dock to lock crane was 13". The start of lock entry. Richard Woeck, crouching, talking with crew in lock. Note the guard rails removed. Peter Woeck was in the tower overseeing the delicate operation and with the tower operator was in constant communication with all vessels involved. Also there in the tower was J. Fisker-Andersen's son, Jim, whose parents realized how special the day was going to be and took him out of school for the day. Instead of reading about history, he would watch it happen. When asked to describe the atmosphere in the tower said ,"It was very ... quiet"! Jim also remembered someone being dispatched during the process to get a blow torch to remove some fixture which had not been accounted for. Others have made similar statements but so far we have no identification of what that may have been. As the boats were inching their way into the lock constant readings were being forwarded to each vessel in turn as to how they would need to adjust their position as needed. The guard rails on the north side had been to be removed earlier for clearance, but temporary rails were put up to ensure crowd safety. Those that were there that day were getting a once in a lifetime show. 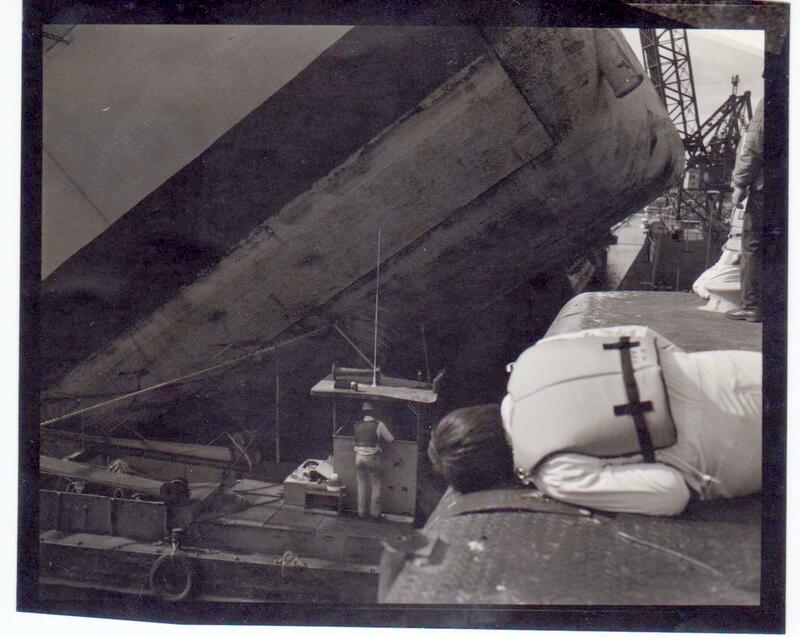 Notice the crewmen walking on the dock. (Click to enlarge). When Lee Crider, the rear tug captain was recounting the days events he remembers it all going quite smoothly despite the complications of the process. He recalled that the only issue was the coordination between the pilots and tug captains as to how to maneuver with such precision. Needless to say this wasn't as simple as pushing a barge carrying a load of concrete through the locks. According to Lee, they were able to work successfully together when the pilots would call out the position necessary, and the two tug captains would know how to coordinate their steering so as to achieve the desired result. Wooden "fenders" attached to avoid damaging lock wall. 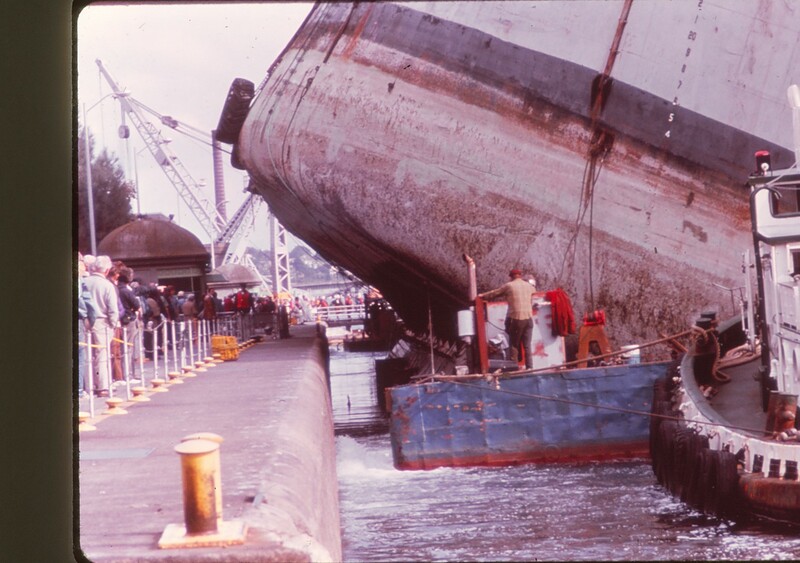 Once the last tug had cleared the gate it was necessary to close the gate before the tide had started to recede. This would mark the most crucial point of the operation as if the tide receded too far with the gates open the White Sands would come to rest on whatever top of the lock wall would still be standing. Lee Crider, when asked what were the options if the original plan failed, replied "There was no plan B. They'd have to get the torches and cut her up into pieces". Gate arm (yellow) in closed gate position. This was proving to be a charmed day however and they did in fact enter the lock and shut the rear gate before the tide would lower. The danger of being caught without enough tide had been avoided. At this point, Larry Gillespie, who had been the superintendent of this project, went to fetch a package he had brought on board for this exact occasion. Opening it up he removed a bottle of champagne and broke it open in celebration. When reminded that it was still necessary to get the dry dock out the other end and there was still work to be done, replied that his job was to get the White Sands from San Diego into the locks and it was now up to others to get it through the locks. His involvement in this special project had come to an end. That may be, but there was plenty more to be concerned about. Larry Gillespie celebrating getting the White Sands inside the lock with champagne. Several hours into the process. and the two thruster vessels needed to make constant adjustments to preserve the little space clearance that existed between the White Sands and the lock walls. 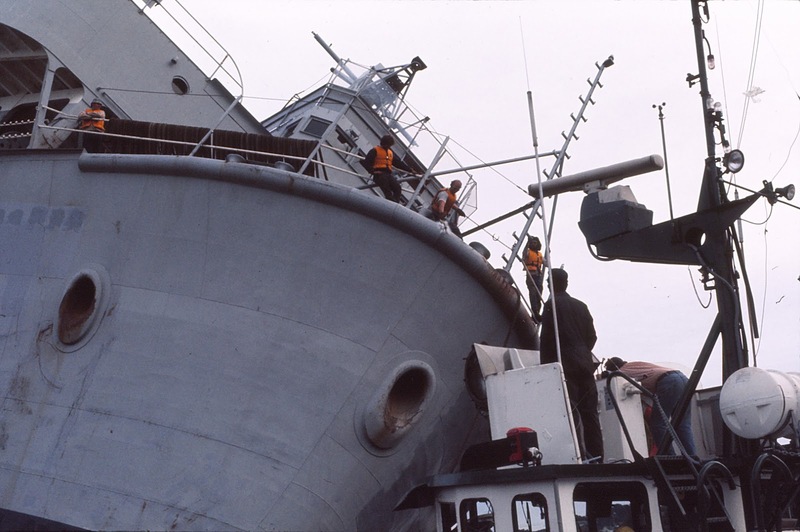 Thruster vessel adjusting position in lock. 491 feet of challenge in lock. Journey close to an end. At the far end of the lock is the fixed crane and there was the smallest clearance in the entire operation. A mere 13 inches. By now the process was almost 4 hours long and all involved had been working in perfect coordination so the crane was left in place with not so much as a scratch on it. It was 5:00 pm when the dry dock cleared the uppermost gate and a total of 4 hours was used to transit the lock. 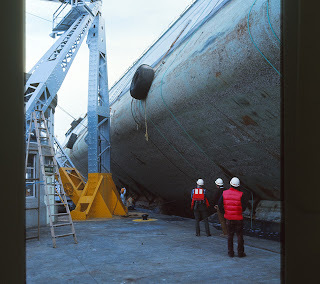 No injuries, no damages but instead an amazing story of determination, imagination and a lesson as to how to fit an 81' dry dock through an 80' lock. The Army Corps of Engineers motto is "Essayons" which is French for "Let Us Try" which was certainly in evidence on this project. 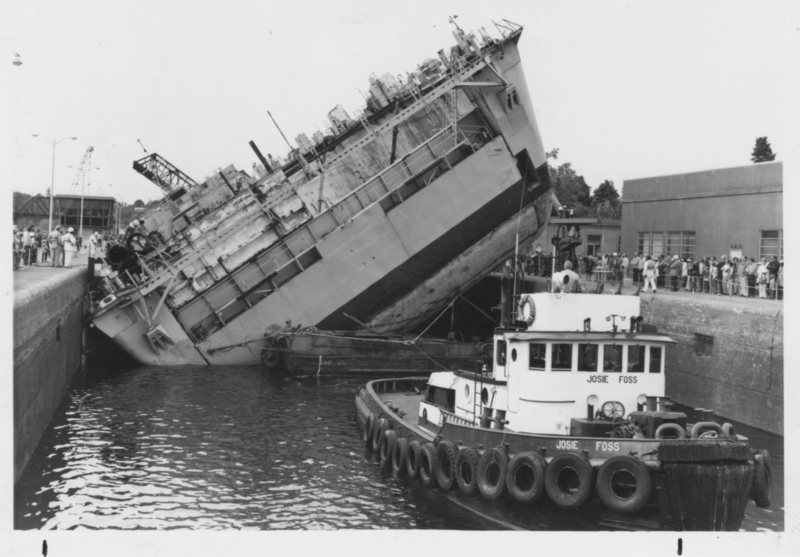 It was almost a year after the dry dock was purchased from the Navy and in the meantime, Marine Power and Equipment was starting on the barge project. Using their existing sites they had made a great start on production and had streamlined the process to a point that they would eventually finish the contracts well ahead of schedule and earn a rare Navy E-Award (for efficiency). In fact, they had so perfected their manufacture that the White Sands was never used at all on the project it had been purchased for and had been the reason for all the planning and alterations taken over the last year. Peter Woecks improbable goal of bringing the White Sands into Lake Union had been realized and featured prominently in the company's ability to provide a workplace for hundreds of people and local businesses. His son, Richard, remembers his father praising the Army Corps of Engineers for all their support and cooperation. 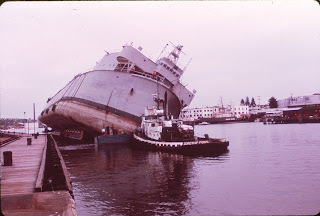 Richard also remembered that Marine Power and Equipment had been awarded a certificate citing its successful transit into Lake Union as the "Engineering Feat of the Year". We are still in search of which engineering association might have given this award. 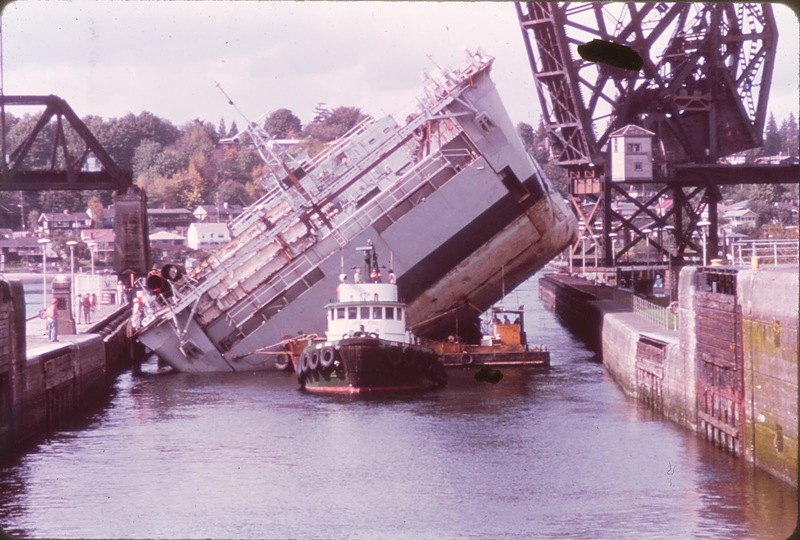 After many years the White Sands changed hands, being sold to Lake Union Dry Dock where it is still in service 37 years after its arrival. If you're on Lake Union you can see it at work down at the southeast portion of the lake. It looks quite different than it did during its Navy and CIA period. The front had been chopped off to enable it to be moored flush against the shore and 2 large cranes are sitting on top of the deck but resemblance aside, it is still a major workhorse for the maritime industry and will always be the subject of a good story. Many people helped in gathering the information and they will be acknowledged here. 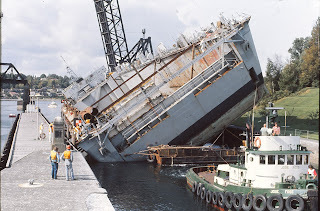 One thing most had in common when recalling this event was the smile and head shaking, accompanied by "That thing will never leave Lake Union"! We hope to keep adding to this story so please contact us with stories or photos you might have. P.S. Rumors that requests for early retirement were received the next day from assorted crew and Corps employees has not been verified. The White Sands today. The blocks are for resting vessels on. The front of White Sands cut off. One of the cranes at far end. 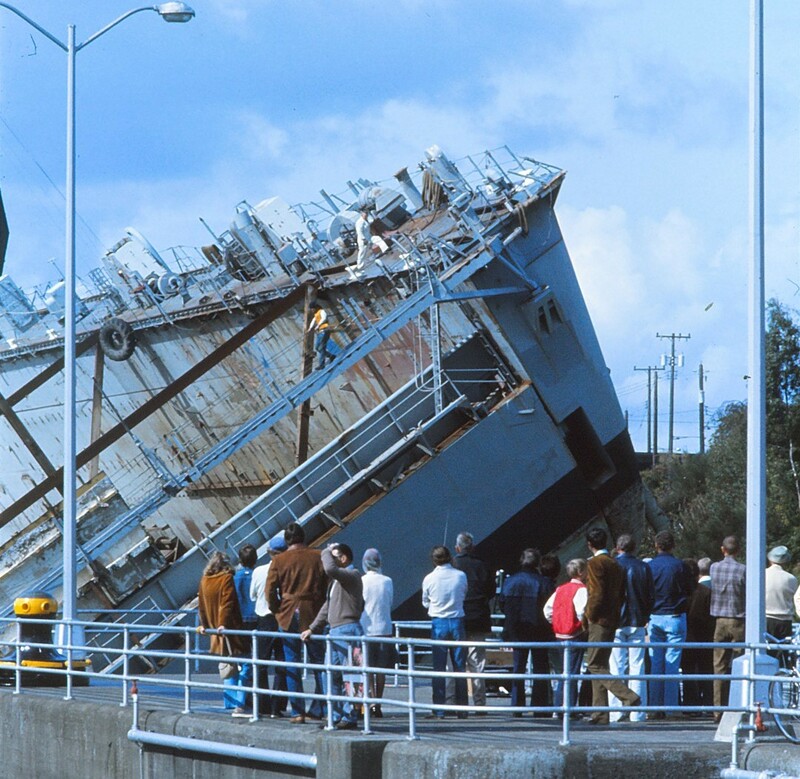 Photos are courtesy of U.S. Army Corps of Engineers. 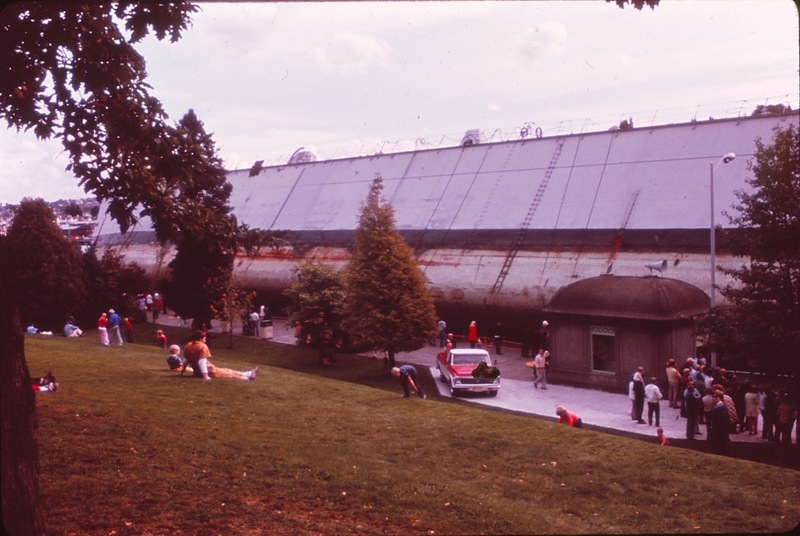 Article titled "Oversize Dry Dock Passes Chittenden Locks"
Fish Ladder Reopens and the Sockeye are here!